Weeping Willow er en 1899 Historic Queen Anne med 12 sone varmesystem, gyngestol veranda, dype grønne fjellutsikt, trygg tur til Village svømmebasseng, tennisbaner, fotball, baseball felt, basketball, hestesko, og en lokal periode museum, Village bibliotek, fall løvverk, boblende Kill Creek, og antikke shopping. Dette omhyggelig restaurerte "malt dame" er bare to miles til Belleayre Mountain (alpint og langrenn, musikkfestivaler, Pine Hill stranden, jakt, Esopus Creek Fluefiske, tubing, Hanah Country Club golf, ridning, fotturer og sykkelstier) og har en sentral og gunstig beliggenhet i Catskills Park i Four Season Resort Village of Fleischmanns, Delaware County, NY. Slapp av i en klassisk stue med antikke takvifte, en koselig peis og en 32 "HDTV. vert i en formell spisestue med godteri stripe tregulv, butler pantry, våt bar og vin kjøligere. Cook i en moderne og velutstyrt profesjonell Viking kjøkken med granitt benkeplater eller nyte dekk med en propan eller kull BBQ. alle badene er velutstyrte med hårføner og store bomullshåndklær. Kjøkkenet har et profesjonelt vikingekjøkken med mikrobølgeovn, oppvaskmaskin, matvarmer og profesjonell Viking søppelkomprimator. Vennligst resirkuler kortbrett, bokser, plast og glass. i won't come back. i don't know guests are charged with cleaning fees when the house is kept so unclean. I give 2 star for the location. Sorry that you were disappointed with your experience at Weeping Willow...the rentor before you broke the bedroom door and the special order did not arrive on time. I spoke with the cleaning company about the cleanliness of the house and they have been put on notice. Another nice stay at the Weeping Willow. This is our 3rd time staying at the Weeping Willow. It has plenty of room and beds to fit a large informal group of friends. 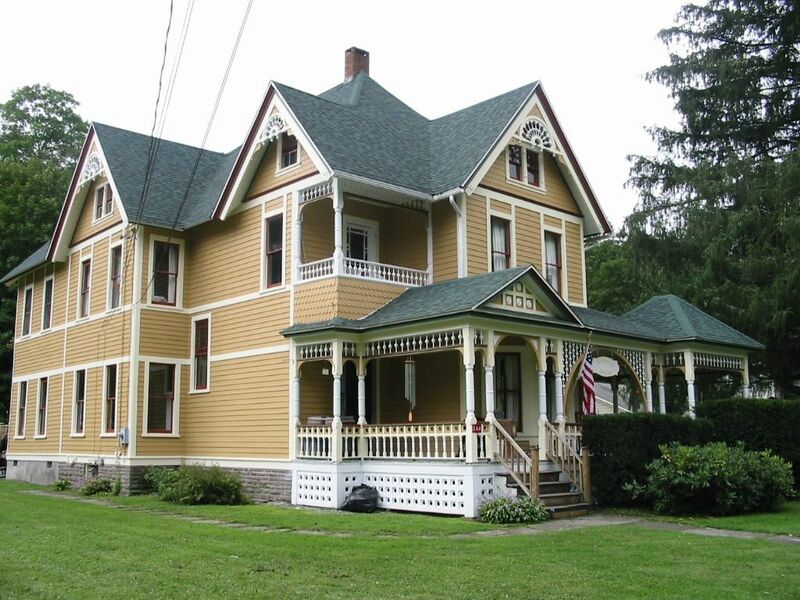 We recommend this as a fun place to stay, typical of the style of the Catskill recreational area. I hope others are inspired by the Vega's example to fix up more of the grand old homes in Fleishmanns and surrounding villages. Thank you Mariano! Thank you for your kind review...I am a member of a local non-profit, Fleischmanns First, that promotes fund raising and activities for the improvements Fleischmanns and the Village Park...progress is slow but steady and in the right direction...you are welcome back to measure the progress. This place is good for a large group! Everything is well-organized and prepared. Me and my group spent awesome time here. Also the neighborhood is safe and quiet! Also the ski mountain is near by, so it would not take a long time to get there. Definitely recommend here!! Outstanding guest...easy to commuicate with and very respectful of the house rules and they left the house in very good reasonable order...stongly recommend them to other host. Wonderfully large property, perfect for families. Exceptionally large property with tons of space for families and children. Central located in Fleischmann's with a nice park right across the street. Good common spaces for large families, and a large functional kitchen with excellent wares. Had a great time, thank you! So pleased that you enjoyed all the features of Weeping Willow and the Village Park directly across from our home...the modern professional Viking appliances bring out the chef in all of us. Our short three days rental staying at the Weeping Willow home were barely acceptable. The home is nicely kept from the original style, we expect the interior finish can be more modernized for the cost of rental we booked. There are good and bad experiences we had staying at Weeping Willow. The internet was the major issue for us since phone service was not usable and we are depends on the internet service, password provided was not working, no service from the beginning, we end up contact Verizon ourselves to get it straight up. Laundry room downstairs, piles of dirty sheets and towels on the top of machine, its impossible for us to use the washer or dryer. The other side of basement is under construction, area is bare with grovel, bricks etc, all unprotected. Two gas grills in the back yard, both tanks provided were almost depleted, we barely make it for one meal, though the owner is did offer us to buy locally and promise to reimburse, we give up after tanks were emptied, it too inconvenience for us. There are so many unnecessary antique furniture in the house, especially the room I was staying at, has two large dressers, a baby crib, and a full size bed in less than 10x10 room makes impossible to move around. All shades are rather too shady, a suggestion for the owner maybe change it to white sheer curtain, it would be nice to bring in some of the natural light. All rooms are rather very depressing to stay in. The kitchen is nicely renovated, modern as we expected, the attic has 5 twin beds and extra space for sleeping bags, our kids were all happy play and sleep all on the same floor. Access to the attic can be very tricky, watch out for the head injury. Living room area has entertainment system are nicely set up. There is a large open grass field directly across from the home, and tennis court were great feature for our staying. Too bad there isn't a basketball court. The community swimming pool were under construction during our stay, its a con as well. Overall, very friendly home owner, but hard to reach since this place is too remotely. Home is rather old fashion, look and smell old, definitely need update, rooms are crowd because of the extra furniture, great location for outdoor fun, definitely kids friendly. Weeping Williw is a Historic Queen Anne Victorian, circa 1899 well represented by all the pictures and video available on the website. There is major restoration going on in the subbasement, which is off limits to the guest. The other three floors are filled with period antiques that reflect the era of the home. All windows have elegent curtains with block out shades to make the viewing of the HDTV easier. As a large home, we provide a crib for parents with young children and the attic was designed for children to enjoy. The kitchen is a high end Professional Viking kitchen for the chef within us. The wifi in the Catskill Mountains is a slow DSL, with patience the system works and cell phone service works best if one uses Verizon. VIEW THE VIDEO of the inside of the house, it truly reflects the historic nature Eastlake period. My family and I, very much enjoyed our recent stay at Weeping Willow. It was like we had all the amenities that we enjoy back home, from books, to board games, cards, TV... with plenty of comfort and hospitality. The location is also great because it's so close to Belleayre Ski Center and other area attractions. Weeping Willow er en Queen Anne viktoriansk i en fire sesong Village Resort i Catskills Mountains, rik på historie, ski, golf, fotturer og fluefiske, med en sterk tradisjon i kunst, musikk og lønn festivaler. Slappe av eller underholde er ideelt for familiesammenkomster, bryllup, delt med andre familier eller større grupper som ønsker å unnslippe presset av urban livsstil, og oppdage viktoriansk tid i et hjem som respekterer det siste, men nyter bekvemmeligheter til stede på en profesjonell Viking kjøkken som er godt utstyrt, en familie rom som har en 55 "HDTV og surround lyd, en 32" HDTV i stua, og en 42 "HDTV på loftet. Ski: Belleayre Mountain-- ideelt for familier.